As with any pet, having a pet jellyfish takes some time, dedication and care on your part, the pet owner. Taking care of jellyfish means taking care of their watery environment & feeding them something nutritious— given you have a proper jellyfish tank for them to survive. What is expected of you now that you have a pet jellyfish or two or three in the house? Well, you will have to feed them daily and conduct a few simple water tests each week. You will also change out some filters & some water and clean the interior of the tank. 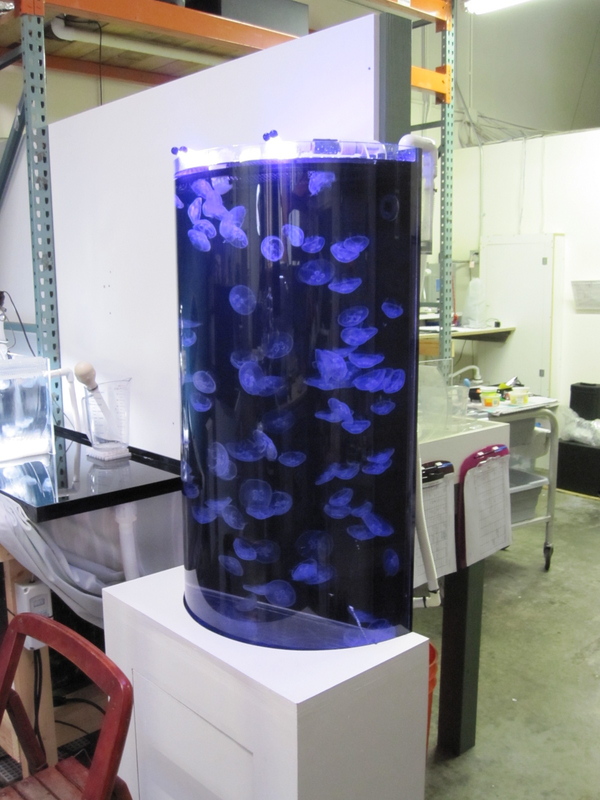 Of course, the size of your jellyfish tank will determine just how much time these tasks will take—the bigger the tank, the more time & water is needed. Below is the maintenance schedule for the 10gallon Eon Jellyfish System, just to give you an idea of the maintenance required. •Once a week you test the water quality & will change 1 gallon of saltwater, change the mechanical filter & clean the interior surfaces of the tank (30 minutes time). •Every other week you will also change 1 of the 3 carbon filters (an additional 5 minutes). •Every three months you will clean out the spray bar holes and the drain screen, along with the pump and check valve (an additional 20 minutes). •Every year you will remove the jellies & filters and bleach & dechlorinate the system. Because moon jellies are 96% water, most of your attention will be on the quality of the water your jellies are living in—they literally are what they swim in—so keep it nice! On a daily basis, the Eon’s built in wet/dry filter will maintain your biological & chemical filtration and therefore, water quality and clarity, only requiring a 1 gallon water change each week. It is a simple routine that is easily followed. And in doing so, you can certainly expect to see happy, growing jellies in your home! Enjoy! Prev Do Jellyfish Need to be Kept in Round or Cylindrical Tanks? Our 7 yr old daughter woke up telling about her very detailed dream of having a Jellyfish as a pet. We told her, sorry, pet shops don’t sell them. She asked us to check Google….surprise surprise. Cool! Let us know if you or your daughter have any questions!! !